The difference of approach of the trinitarian mystery is not a philosophical one. It is based on a fundamental interpretation of the New Testament by the Greek fathers who understood the Christian faith as primarily a revelation of divine persons. The Christian faith to them is first of all an answer to Jesus’ question, “Whom say ye that I am? … The Son of the Living God” (Matthew 16:15-16). The authority and effectiveness of Jesus’ actions, as well as of His teachings, depend upon His personal identity. Only God Himself can be the savior, only God overcomes death and forgives sins, only God can communicate divine life to humankind. And the same approach is valid for the interpretation of Jesus’ sending of “another” from the Father—the Spirit. 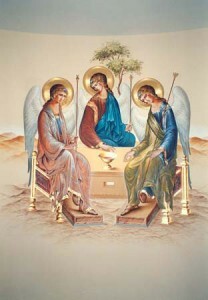 The primarily personal revelation of God is discovered by the early Greek fathers not only in the classic trinitarian formula—the baptismal formula of Matthew 28:19, or the three gifts personally qualified in II Corinthians 13:14 (“ the grace of our Lord Jesus Christ, and the love of God the Father, and the communion [κοιυωυια] of the Holy Spirit”) but also in the Spirit speaking personally to Philip (Acts 8:19), to Peter (Acts 10:19; 11:12), to the church of Antioch (Acts 13:12), to the apostolic council of Jerusalem (“it seemed good to the Holy Spirit and us”-Acts 15:25). The Spirit is understood here as a presence distinct from that of Jesus but possessing the same divine sovereignty. It is therefore understandable that the insistence by the Cappadocian fathers on this personal (hypostatic) distinctiveness could lead them to a trinitarian system in which their enemies saw tritheism. They were willing to run that risk in order to preserve the biblical understanding of a living and acting God, fully independent from the impersonal idealism of Greek philosophy. Even the Nicaean formulation of “consubstantiality” was long suspect in the East—and not only among the Arians—of being both unbiblical and too philosophical. It was finally accepted, but only in combination with the traditional (Origenistic) reaffirmation of the three hypostases in God. The struggle against Arius, who accepted the distinction but not the substantial co-quality and co-sovereignty of the divine persons, was about the nature of salvation. This is particularly evident in the writings of Athanasius. It immediately and necessarily involved not only the person of Jesus Christ, but also that of the Spirit through whom the Son of God became man in the bosom of Mary, and through whom also, until the parousia, He is present in His body, the Church. In is in writings by Athanasius—his Letters to Serapion—that one finds the first elaborate patristic argument defending the divinity of the Spirit. It is the same soteriological approach that one finds in the other major fourth-century treatise on the same subject: the De Spiritu Sancto of St. Basil of Caesarea. Both Athanasius and Basil consider the saving activity of the Spirit accessible to the Christian experience, as being necessarily effected by God Himself. Since the personal character of the Spirit is taken for granted, the evidence of the Spirit’s divinity in there to see. The divine identity of the “comforter” is, therefore, a basic coordinate of the Christian idea of salvation. It is reflected not only in the theological tradition of the Christian East but also, very prominently in its liturgy. A prayer addressed personally to the Spirit, “O heavenly King,” is the initial act of every liturgical action in the Orthodox Church. The sacraments and, more particularly, the sacrament of the Christian koinonia itself, i.e., the eucharist, culminate in an invocation of the Spirit. Hymnology, especially that of the feast of Pentecost, proclaims the same relationship between the Spirit’s act and His divine identity: “The Spirit bestows all things: it appoints prophets; it consecrates priests; it gives wisdom to the simple; it turns fishermen into theologians; it gathers together the whole assembly of the Church. O Comforter, consubstantial in co-reigning with the Father and the Son, glory to Thee. In the text of the Nicaean Creed, in fact the creed adopted at the Council of Constantinople in 381, the divine identity of the Spirit was defined in terms of His “procession of the Father.” This definition is in accordance with the theology of the Cappadocian fathers who saw in the person of God the Father the very “origin of the Godhead.” It is precisely as God that the Spirit “proceeds from the Father” directly, while creatures are not direct products from the Father but come into being through the operation and mediation of the Logos. Thus, the proclamation of the Spirit’s “procession from the Father” is equivalent to the proclamation of His pre-eternal divinity. At this point, it is easy to discern the difference of approach to the mystery of the Trinity between the Greek fathers of the fourth century and the Latin West. In trying to define a doctrine of salvation, the Latin West became preoccupied with the issue of justification by faith, its relation to human “works” and produced systems explaining the very process of salvation, e.g., the Anselmian doctrine of satisfaction. The personal divine identity of Christ and the Spirit, though an intellectual necessity—“only God Himself can fully satisfy divine justice”—became in fact a peripheral issue rather than a matter of direct Christian experience, grounded in the Gospel itself and providing the starting point of theology. This development itself based upon a doctrine of God that tended to relativize the personal, or trinitarian life of God, and approach Him first as one single essence, while considering the persons as internal “relations.” There is no doubt that this approach to God, popularized by St. Augustine, is, to a degree, responsible for the fact that so many Christians today are practically deists. Venerating God as a single “heavenly Father,” they tend to view trinitarianism as a mere speculation. In such a context, there is no real place for a theology of the Holy Spirit expect in terms of “gifts” unrelated to the internal life of God. These obvious differences of perspective between East and West constitute the background of the famous controversy on Filioque. As is well known, the “Nicaean” Creed, which was adopted as a solemn confession of faith by the universal Church at its ecumenical councils of the fourth century, was interpolated locally in Spain (sixth or seventh century). The interpolated text was adopted throughout Carolingian Europe (eighth through ninth centuries), in spite of strong objections by contemporary Roman popes, it was transformed into a tool of anti-Greek polemics by Charlemagne. The interpolation consisted in an insertion of the words “and from the Son” (Latin: Filioque) in the text of the creed, so that the paragraph which originally affirmed the procession of the Spirit “from the Father” (simply quoting John 15:26), now read: “(I believe) in the Holy Spirit, Lord, Giver of Life, who proceeds from the Father and the Son.” Eventually, under German pressure, the church of Rome itself accepted the interpolation in spite of violent reactions by Greek theologians, particularly Photius (ninth century), who were not objecting to the idea that the gifts of the Spirit—in the “economy” of the incarnation—were granted through Christ, i.e., through the Son, but against the Augustinian reduction of the hypostatic, personal life of the three divine persons to mere “relations.” Photius considered the Latin understanding of God as “modalistic” (“Sabellian” or “semi-Sabellian”). Contemporary Orthodox theologians, particularly Karsavin and Lossky, have expressed the opinion that the Filioque dispute is at the very root of ecclesiological differences between East and West. In Western “papal” ecclesiology the presence of the Spirit, i.e., a divine presence which restores and enhances a person’s free response to God, is fully subordinated to the ecclesiastical institution, based upon a “vicar” of Christ. Whether or not one accepts this scheme, which may appear as somehow artificial, it is certainly true that essentialistic deism, hardly allows for any real theology of the Spirit as an active, personal and guiding presence in the church community and in the personal life of the Christian. The “gifts of the Sprit” tend to be understood within the framework of individual or group psychology, for which there can be no ecclesiological or theological framework. In any case, in order to understand the Orthodox approach to pneumatology, one has to start with the divinity of the Spirit as that was established in the great anti-Arian controversies of the early church. Then one must accept a trinitarian theology which presupposes that the personal identity of the Spirit is understood absolutely, together, of course, with the doctrine of consubstantiality, preserving the essential unity of the Godhead.